I had the lovely experience of spending two hours with @connieburke in a Chevy Corvette Grand Sport while we were at SxSW. It wasn’t because I’m anything special. Chevy had two ‘vettes, two Camaros, and the Chevy Volt ready for Ride and Drives so that folks could have the experience. On Sunday when my SOBCon partner, Terry Starbucker walked by the cars, we stopped to say hello and talk to Connie about how ride and drive was going. All I did was ask. All Connie did was ask. 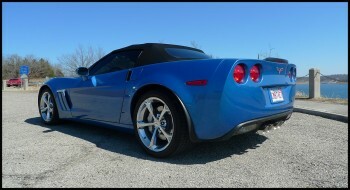 As it turned out, Tuesday it was raining … our GOOD luck because it meant we got the Blue Grand Sport for a couple of hours. Connie and I hit the road at around 11:30 a.m. As we started, she was driving. Google maps wasn’t much help getting us to where I wanted to go. We ended up having a conversation with Onstar. Seemed kind of weird having OnStar in ‘vette, just sayin’ … Good weird though because it got us to the “pink flamingos” at Pots and Plants the Nursery at 360 and Bee Caves Road in Austin. 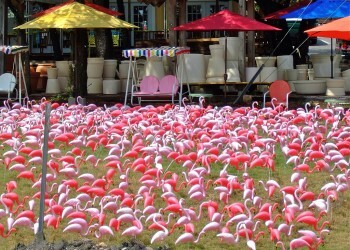 The flamingos enticed us to pull in and park. 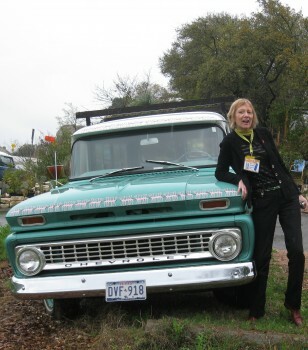 But I think Connie was most partial to the old Chevy truck. Or maybe she was just taking pix for my dossier. Oh yeah! I was driving the ‘vette. While we took 360 out to 2222 old route then to 620, I told stories of ’69 ‘vettes — one that my best friend, Nancy, raced in gymkhanas and another that my husband raced in the Grand Nationals. When we reach the house I once lived in I looked over the fence to see the red oak I planted in the clay caliche soil in the dry Austin heat. On the way to Austin’s famous Oasis restaurant on the lake, we told stories about how our kids grew up. We talked business and possibilities. At lunch we did about 10 minutes trading our favorite Stephen Wright jokes. Who knew that about either of us? And at the end of lunch, I bought t-shirts for my son and my husband who’ll remember many meals we shared there. That’s how a car connected Connie to my best friend, my husband, my son, a house we built — all parts of my history — and a hillside full of pink flamingos. I became a person during that conversation. So did she when she told me some of the same things. You can bet that I’ll be showing up if she calls. Proof to seal the deal is that I’m not sharing the conversation on the way back into Austin down 6th Street. 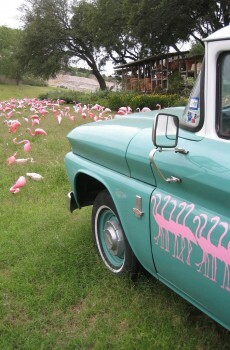 Itâs not so outlandish that blue âvette and some pink flamingos would lead to good business â¦ The car connected us in a mutual experience. Our trip wasnât about the car it was about the people in it. The car started a conversation that led to a relationship. I canât imagine how much longer it would have taken to cover the same ground without it. This wasnât a free ride without purpose. It was building relationships one person at a time. Back at the convention center, our meeting with Mark Horvath went even better because we knew other just that little bit more. Every business is relationships and relationships are everyoneâs business. Companies who reach out fearlessly with trust in their customers are the ones who can win. You must have a story about how a product connected two people in business. Will you take a minute to share it now? Thank you, Connie and Chevy for that â¦ looking forward to how weâll be helping folks in North Central region with the new initiative. A high-power company in educational publishing, bought three smaller companies and put them together. They think they offer a diverse portfolio. I think they offer a menu of bacon, ice-cream, tofu, and cognac. They are quite equipped to make the district-wide, state-wide sale. But rare is the sales rep who has the time or experience to speak to the details and nuances of the four individual product lines that they offer. I still keep my personal blog at two click exchanges. I do that for lots of reasons. I feel a little sentimental. My little blog found it’s first friends in such places and I still like exploring them. I also like to watch how such things work. The business models interest me. I want to watch as they introduce new features. I want to see how each community reacts to them. YES, the mike will be open again tonight so start collecting your thoughts. Remember the mike is open there is no post you get to bring what you want to talk about. The rules are even shorter this time — no mean talk. We got things going fast and furious last week. So, if you missed it, stop on by and check it out. It lasted into the wee hours of the night and the best parts happened long after I was gone.